Pair it with some greens — such as kale or spinach — and basically you have found the fountain of youth. 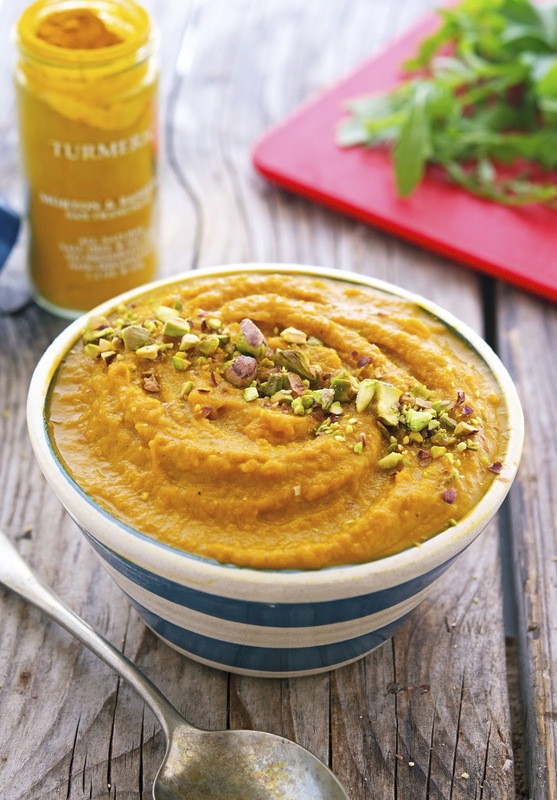 Okay, that might be a bit of a stretch but I can say without hesitation that these Creamy Turmeric Mashed Sweet Potatoes are really, really, like REALLY good for you! Let’s start with sweet potatoes: they’re rich in complex carbohydrates, dietary fiber, beta carotene (a vitamin A equivalent nutrient), vitamin C manganese, copper, pantothenic acid, and vitamin B6. 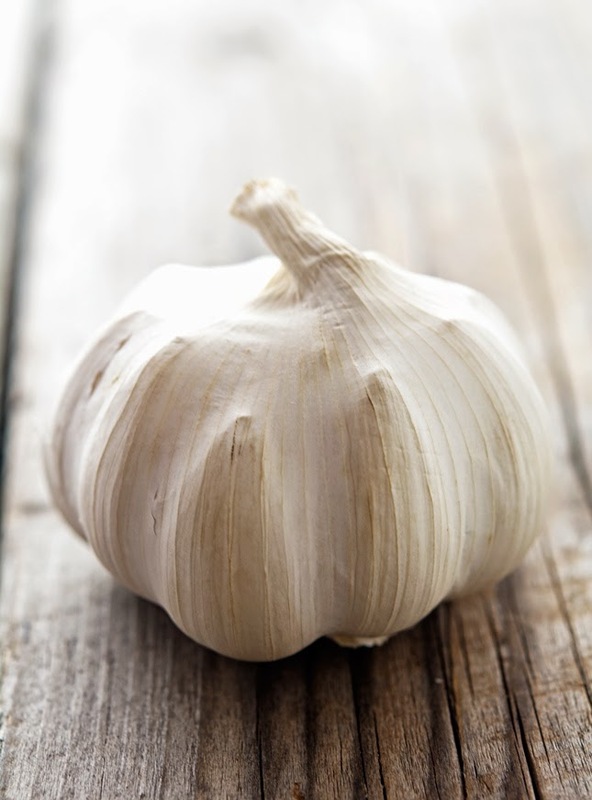 Garlic contains a compound called allicin, which has potent medicinal properties. It’s also a very good source of manganese, selenium, vitamin C, and other minerals such as phosphorous, calcium, potassium, iron and copper. 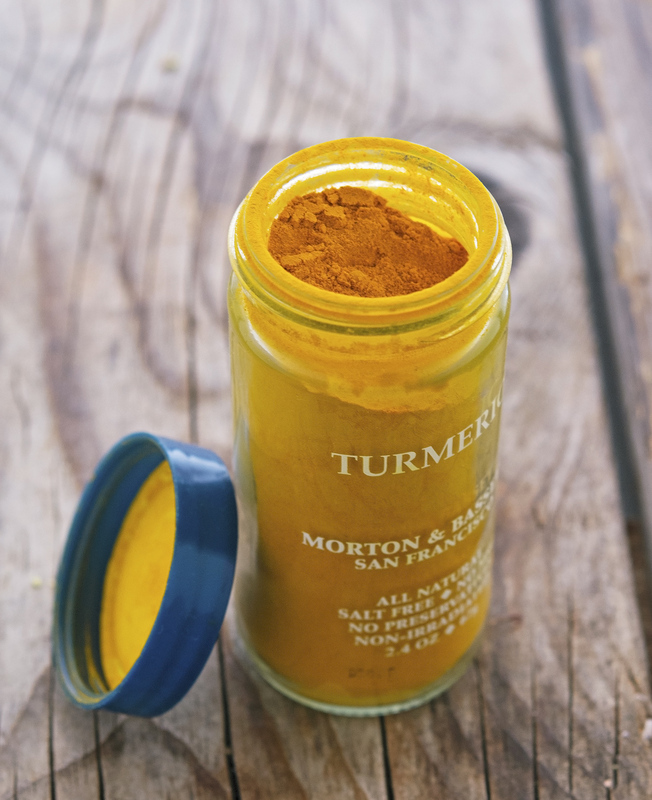 Turmeric has been long-known for its anti-inflammatory and immune supporting properties, and recent studies have revealed that this spice is a natural wonder, providing benefits in the treatment of many different health conditions. And olive oil, do I need to talk about olive oil? The main type of fat found in olive oil is monounsaturated fatty acids (MUFAs) that are actually considered the healthiest dietary fat there is. I told you this is good stuff. But you know what’s even better? That these Creamy Turmeric Sweet Potatoes are ricas. Muy ricas. Riquísimas. 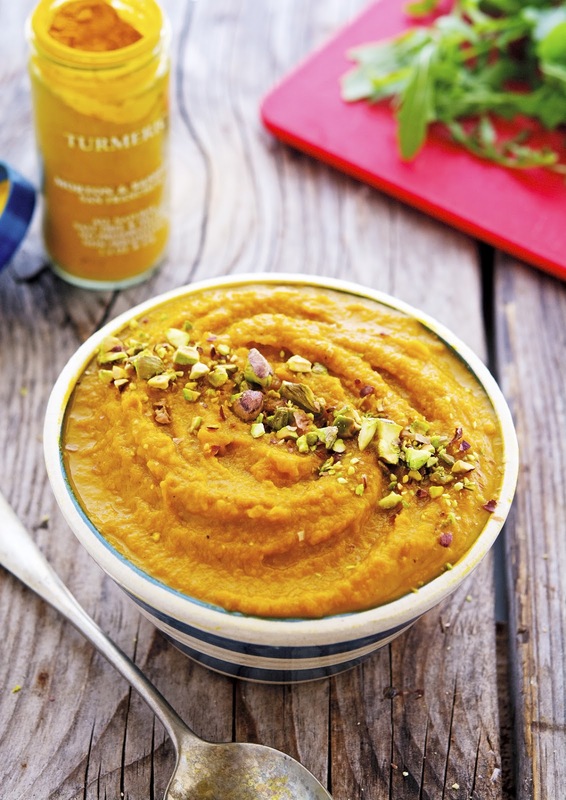 Creamy, with a hint of turmeric, and that good fragrant taste of garlic that is to die for. They go well with meat, fish, eggs, but they’re delicious even on their own. I might (or might not) have just inhaled the full bowl in one sitting. Mmmmmmm. So good, damn I was lucky. And I might have also added a couple of years to my life expectancy. 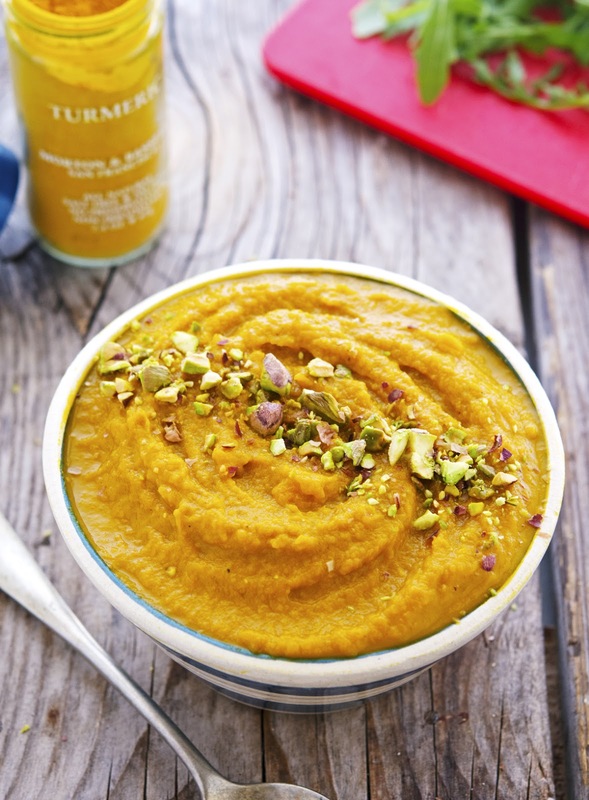 Creamy Turmeric Mashed Sweet Potatoes Print this recipe! Heat olive oil in a large skillet over medium-high heat. Add sweet potatoes and give a good stir. Add turmeric, toss to coat. Add garlic and sautè for 2 minutes, until fragrant. Add vegetable broth and bring to a boil. Reduce to a simmer and cook until the sweet potatoes are soft and the liquid is almost absorbed. Transfer to a bowl, add coconut milk (if using) and mash until smooth and creamy. Season with salt and pepper, sprinkle with chopped pistachios, and serve! One serving yields 110 calories, 5 grams of fat, 16 grams of carbs, 1 gram of protein. What would you serve this with, protein wise? Okay, so I'm not going to lie... I saw the photo and came here thinking it was a smoothie bowl (it's been a long day) but this is SO much better! Love the addition of the pistachios, too. Can't wait to give this a try! Now that you make me think about it, it can definitely look like a smoothie bowl. Ha! Getting my wisdom teeth out on Friday and I just bought some sweet potatoes to mash up! This will be the perfect soft food to eat while I'm recovering. Thanks! Good luck with on getting your wisdom tooth pull out, I've heard it can be pretty painful! intend to try this very soon! You should definitely use turmeric more often Ben, it's delish and so good for you! These were great as-is! I also made some today with half sweet potato and half cauliflower to cut down the carb count. Just as good!! I love that you tweaked the recipe to make it low-carb. I need to try it with cauliflower as well. Sounds like something I would really enjoy! Skin on or off on the sweet potatoes?